Today everyone knows that meditation is helpful for the body, mind and spirit. It is held in several schools of different philosophies; one of them is Maum Meditation, which opened a brand new school located at 40-28 82nd Street, led by Yeol Hee Jun. Maum comes from the Korean word that means mind, heart, soul and spirit. The Maum Meditation practice helps to change the human mind into the infinite universal mind “to be born again with the mind and body of the universe,” says Jin Haeng, who works at the school. She explains that they don’t only teach you how to meditate but most importantly they act as a guide to help people change their own minds for “the true mind or universal mind.” “If we are reborn eternally, we’ll never die,” says Yeol Hee Jun’s assistant. Maum meditation defines the human mind as a cumulative of photographs saved inside the mind and body. These photos are the accumulation of past experiences, taken by the eyes, ears, nose, mouth and body. The images mold each being in a unique pattern of thinking and common behavior that doesn’t portrait who we really are. The photographs, stored in our minds, are a conjugation of emotions, thoughts and bonds with people, places and things that create the individual world of images. Maum Meditation provides the method to subtract these images to reach the “Human Mind” and to eliminate this world of photos and create a universal mind, which is the truth. Maum Meditation started in November 1996 and it was stablished by the Korean Professor Woo Myung. The infinite difficulties that he experienced and observed through his life raised his interest on finding a way to reach peace and happiness for himself and others. In January 1996, while he meditated in the mountains of South Korea, Woo Myung was enlighten and it was then when he founded Maum Meditation and he has dedicated his life to help others to awake through his taught method of subtraction. The method has seven guided steps to gradually discard images, to free yourself from the past, and reach or become the truth. Currently, there are more than 320 centers around the world. There are three in Queens: Flushing, Bayside and the recently opened one in Jackson Heights. Each session lasts two hours, but they are suited to the availability of the students. It is minimum an hour, but Jin Haeng recommends that the longer the better. A class can be either individual or in a group, the number of people doesn’t really matter because “not everyone has the same mind,” she claims. The highest level is the seventh and reaching it can take up to two years, with the intention of applying it in your daily life. 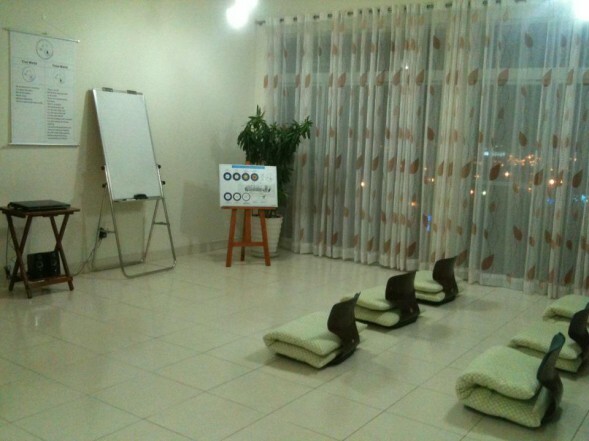 The methodology doesn’t involve music, but a calm environment of relaxation. The center operates based on memberships that range from $100 to $150 per month, depending on the years of commitment. The establishment opens from 8am to 10pm daily. A estas alturas todo el mundo tiene claro que la meditación es beneficiosa tanto para el cuerpo como para la mente y el espíritu. Se desarrolla en múltiples escuelas y corrientes de pensamiento; una de ellas es Meditación Maum, un espacio recientemente habilitado en la 40-28 de la calle 82, dirigido por Yeol Hee Jun. Maum es una palabra coreana que significa mente, corazón, alma y espíritu. La práctica de Meditación Maum ayuda a cambiar la mente humana por la mente del universo infinito “para renacer con el cuerpo y mente del universo”. Jin Haeng, ayudante del Centro explica que en el lugar no enseñan a meditar sino que proceden como guías para ayudar a la gente a cambiar su propia mente por la “mente verdadera o del universo”. “Si uno nace nuevamente, eternamente no tendrá muerte”, dice la asistente de Yeol Hee Jun. Al Centro son bienvenidas personas de todas las edades, desde niños hasta aquellas de edad avanzada, porque todas las personas son capaces de “limpiar su mente”. Maum Meditación define la Mente Humana como una acumulación de fotografías guardadas dentro del cuerpo y la mente. Estas fotos son una acumulación de experiencias pasadas que se toman con los ojos, los oídos, la nariz, la boca y el cuerpo. Las imágenes moldean a cada ser en un propio patrón de pensamiento y comportamiento habitual que no refleja quienes somos realmente. Las fotografías almacenadas en la mente son la acumulación de las emociones, los pensamientos y apegos a personas, lugares y cosas que crean el Mundo individual de imágenes. Meditación Maum proporciona el método para restar esas imágenes hasta llegar a la “Mente Humana”, eliminar ese mundo de fotos y crear la mente del universo, que es la verdad. Maum meditación comenzó en noviembre de 1996 y fue establecido por el profesor coreano Woo Myung. Las infinitas dificultades que experimentó y observó a través de su vida, hicieron despertar su interés en encontrar una manera para alcanzar la paz y la felicidad para él mismo y los demás. En enero de 1996, mientras meditaba en las montañas de Corea del Sur, Woo Myung se iluminó, desde entonces fundó Meditación Maum y ha dedicado su vida a ayudar a otros a que se iluminen a través de sus enseñanzas y su método de sustracción. El método consta de 7 pasos guiados para ir desechando las imágenes, liberarse de las ataduras del pasado y lograr o llegar a ser la verdad. Actualmente, hay más de 320 Centros en todo el mundo. 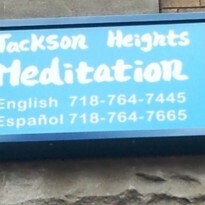 En Queens existen tres: en Flushing, Bayside y el recientemente abierto en Jackson Heights. Cada sesión es de dos horas, pero se adecuan a la disponibilidad de tiempo de los alumnos, puede ser un mínimo de una hora aunque Jin Haeng recomienda que cuanto más tiempo es mejor. Puede ser individual o en grupo, no importa la cantidad de gente, “porque no todos tienen la misma mente”, señala. El nivel más alto es el 7 y alcanzarlo puede llevar hasta 2 años y es para aplicarlo a cada día de la vida. La metodología es sin música, en un ambiente tranquilo, de relajación. El Centro opera a base de membresías que van en un rango de 150 dólares por un mes, la mensualidad de una membresía de un año es de 130; y la de dos años es $100 dólares. El local abre de 8 de la mañana a 10 de la noche. Next post: To Insure or Not to Insure?